But since NY and SF are a tad too far from our doorsteps, we made one that measures how far your electric car can go from our home city, Amsterdam. A perfect plan for your weekend getaway or euro trip this summer. Back in the humble beginnings of EVs, the best-selling electric car Nissan LEAF had a maximum range of about 175 km (109 miles). Fast-forward seven years, and Nissan is working on a 540 km (340 miles) electric car. 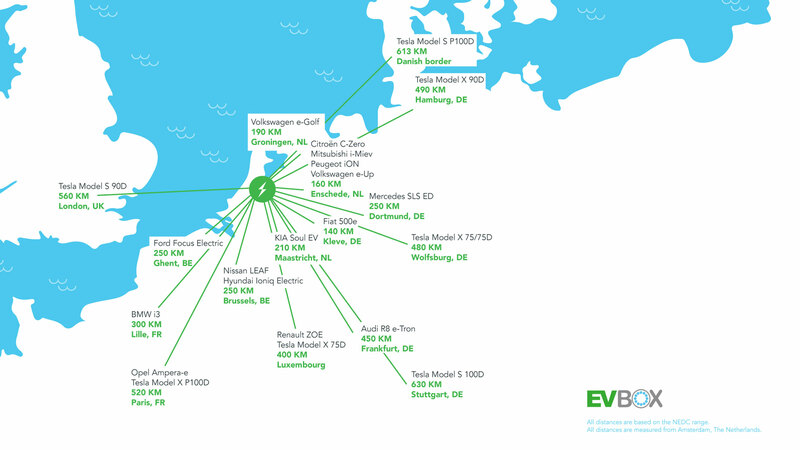 The new Renault ZOE, Chevy Bolt and Opel Ampera-e (all with a fairly affordable price tag) can reach 400-500 km (248-300 miles) on a single charge too. The main cause? Better batteries that have become more powerful, and less expensive. Recent statistics from Bloomberg pointed out that battery costs have dropped by 65% since 2010. This helped them reach $350/kWh in 2015. By 2030, BNEF expects battery costs to be well below $120/kWh. Falling costs of batteries = lower prices for electric cars. Every electric vehicle has hundreds to thousands of separate battery cells. This complex design takes up space – more than 50% of the area dedicated to car batteries is taken up with housing and contacts. As a result, a bunch of engineers came together and thought of something new. The IKTS has recently developed a new battery concept that could substantially decrease the amount of space needed for housing and contacts. This would mean that more batteries can fit in the same car, and that the range can be increased up to 1000 km (620 miles)! Meanwhile, you may ask yourself if 1000 km on a single charge is really needed. What driver with a clear conscience can manage to stay on the road for that long without making any stops?! You would surely need to find a restroom, and stretch your legs. Not to mention that any combustion engine car would need to stop and fill up the tank to be able to reach 1000 km, but now we’re describing the potential for long-distance, cross-border trips. Increased range is exciting and all, but let’s not forget about the daily commute. The distance our cars are actually driving on a daily basis. As we reported previously, MIT found that currently available electric cars could replace almost 90% of all personal vehicles on the US roads, and can still get you where you need to go (and back again). Assuming battery technology improves in line with government estimates, up to 98% of vehicles could be replaced in the US by 2020. I also suggest you need a good carport ,you should go to the Carportbuy , they have some really good car port kit,UV proven and heating proven as well. In The Netherlands, the average daily distance is only 32 km (20 miles). 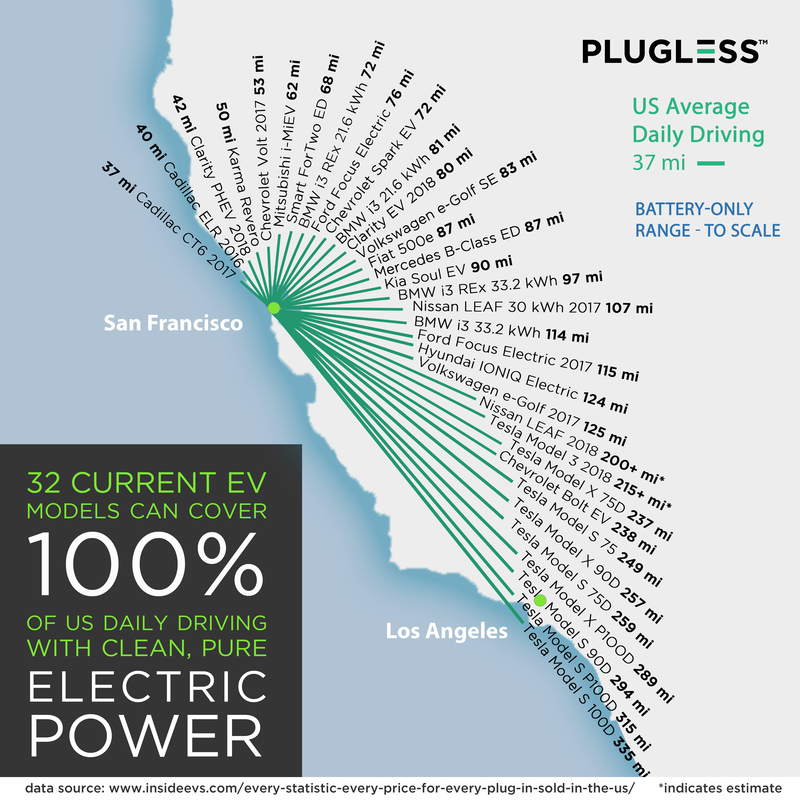 With a bare minimum range of 100+ km (62+ miles) for all-electrics, and 30+ km (18+ miles) for plug-in hybrids, it’s now fair to say that any of today’s available electric cars, can easily cover your commuting needs. NEDC is the official measurement for electric-car range in Europe, yet we’re aware that the given numbers are sometimes overly optimistic. The actual range is dependent on the way you drive, whether you turned on your AC, weather conditions and so on. Most importantly though, plan your route based on the availability of charging points. Because in the rare event that you find yourself stuck with a drained battery, iswhen you realize you could’ve avoided this obstacle by taking 5 minutes to plan your route. This however, has a simple solution - if the restaurant, hotel, and/or city you pass, offers charging points to re-power your car. If they don’t, ask for one! 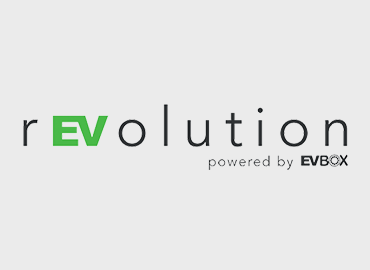 Just like they would give you a parking spot, a hot meal, a warm bed, or even street lighting, EV Charging is an amenity that shouldn’t be overlooked! There are over 2 million (plug-in hybrid) electric cars on the roads worldwide, and more than 500,000 of them are in Europe. Seeing this and the constant increase in EV adoption, charging points are demanded more than ever, even if range anxiety has become an emotional argument over logical argument. Don’t say we never told you so.